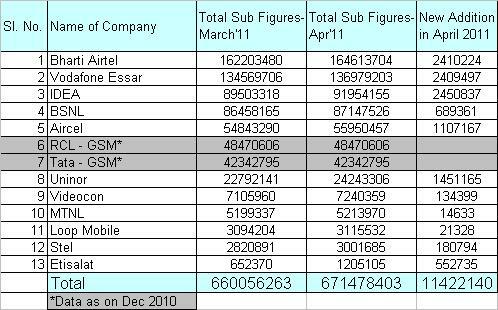 Telecom Operators market share in India as on April 2011 remained almost same as that March 2011. Together the GSM operators added 11 million customers in April 2011. Bharti Airtel added 2.41 Million customers while vodafone added 2.40 Million customers. Idea cellular however cornered most number of GSM subscribers with the addition of 2.45 Million new subscribers. Aircel added 1.1 Million customers while BSNL added 6.8 lakh subscribers.